During an intense afternoon, representatives from the industry, government and authorities gathered for ÅF Green Day in Solna. The theme was "Driving Sustainable development through Connectivity". ÅF Green Day 2015 was held on October 6 in Solna on the theme "Driving Sustainable development through Connectivity". Experts discussed how cooperation and collaboration between different sectors of the business world, between private and public, and between people drives development towards a more sustainable society. What challenges do the new goals entail? What role does the Internet and the telecommunications industry play in meeting the global challenges? How will future sustainable transport develop? What drives profitable, sustainable business? During the day Hans Enocson, President & CEO GE Nordic Region, gave an inspiring presentation about "The idea and vision behind Ecomagination". The panel of experts included Charlotte Petri Gornitzka, Sida, Heidi Huusko, the UN Global Compact, Henrik Sundström, Electrolux, Victoria Percovich-Gutierrez, Malmö, Susannna Salwén, IBM, Matilda Gennvi Gustafsson, Ericsson, Tomas Zimmermann, TeliaSonera, Caroline Ottosson, Trafikverket Anneli Hulten, Gothenburg city, Erik Ljungberg, Scania, Maria Håkansson and Jonas Wiström ÅF, Lena Bjurner, Scandic Hotels, Mia Horn af Rantzien, SNS, and Hans Enocson, GE. The afternoon ended with a presentation by National Geographic’s Martin Edström who gave a speech about how he led an expedition to Son Doong in Vietnam, the world's largest cave. Martin has documented the cave and has created a 360 degree interactive story which is a new way to explore the cave. The guest’s immediate feedback was that they gained many new insights and ideas about how collaboration and cooperation is the way forward to achieve a sustainable society. They also felt that they established new important contacts that they will have the advantage of forwards. 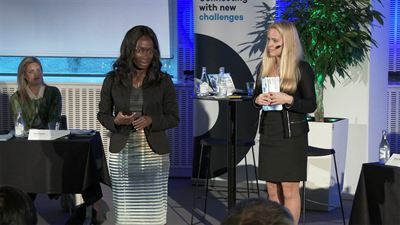 The day was moderated by Nyamko Sabuni, Vice President Sustainability and Lena Ander, Secretary General of the NMC and the Strategic Sustainability Consultant at ÅF.